I originally became interested in vortex generators (VGs) in an effort to improve STOL performance on my homebuilt aircraft. See STOL Action video.The vortex generators improved STOL action very well as you can see, but from all that STOL flying I realized how valuable they are as safety devices on any aircraft. The safety benefits alone are so important that all aircraft should use them even if you’re not interested in STOL! I’ve tried three brands of production vortex generators (CCI, Landshorter, and Pacific Northwest Aero), as well as homemade ones, in an effort to find the best vortex generator design. I placed a different brand on each wing and flew every test to the extreme limit, then swapped brands wing-to-wing to eliminate any bias in the aircraft itself, and did it all over and over again. Many, many hours of flight testing at first light when the air was still and steady. Any differences in performance should show up readily in this wing-against-wing balance test. 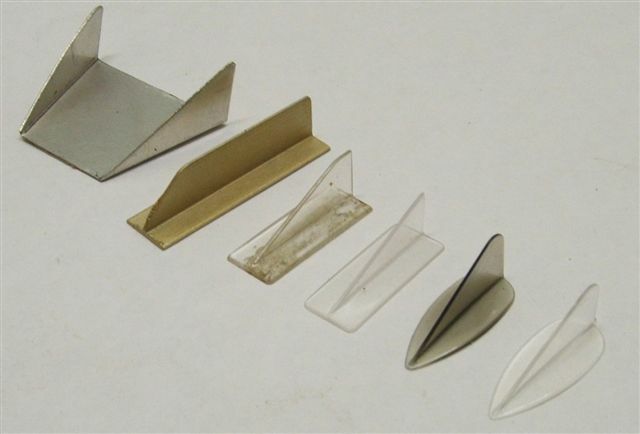 Despite the very different shapes of each of these vortex generators, and claims of wind tunnel testing, etc., etc., I could detect no real difference in performance of any of the production brands of vortex generators – they all worked equally well! But it did seem that the type of VGs mounted in close pairs, generated some drag, whereas VGs mounted singly in an alternating pattern produced no measurable drag. This has also been observed by others who have carefully tried both types of placement. The theory often published is that the counter-rotating vortexes generated by these paired VGs combine to make an even larger vortex. But it appears to me that the counter-rotating vortexes more likely interfere with each other and end up as a 'ragged' and disturbed vortex that tends to lift away from the surface. The longer 'blade' type VGs also produce vortexes, but also with much more disturbance than is necessary. The best vortex is generated by the airflow progessively spilling over the leading edge of the VG that is angled to the airflow. That vortex is slim and tight and tidy, and tends to stay right close to the wing surface, all the way to the trailing edge. So the leading edge of the VG is the critical element of the design. Also important is the streamlining of the base of the VG, such that no blunt edges trip the smooth airflow at that point. The boundary layer is very thin at that point, and possibly still laminar, so it's important not to disturb it. Stolspeed VGs are designed with these factors in mind, and thus produce tight vortexes with very little drag. All of the vortex generators that I tested worked well enough, but it seemed that all the designs of VGs could be considerably improved in regards both user-friendliness and appearance. All of them have sharp points on them, which once drew blood when a full jerrycan of fuel pinned my hand against one. The extruded aluminum ones have a long flat base that doesn’t fit the wing contour at all. The homemade ones do work but look pretty crude. All of them have angular lines and square corners, which doesn’t suit the sweeping, curved lines of a aerofoil wing, so they look like stuck-on after-thoughts. Being a practical designer and tinkerer, always looking for better ways of doing things, I decided we need better vortex generators . So I designed my own vortex generators with fully rounded and flowing lines, and flight tested them against the production models – same performance again. I decided to go with polycarbonate because it’s the ideal material for such a part. It’s very tough, flexible and resilient, and because it can be injection moulded, it can be made to any shape at all. This allows the base to be curved to suit the curvature of the wing surface. The other advantage of polycarbonate over aluminum is the flexibility that can be designed into the fin, so that it can ‘give’ and absorb impact rather than pass the impact to the wing skin. I’ve seen an impact on an aluminum VG put a permanent dent in a tin wing – if it’s a fabric wing it’s likely to cause a tear. 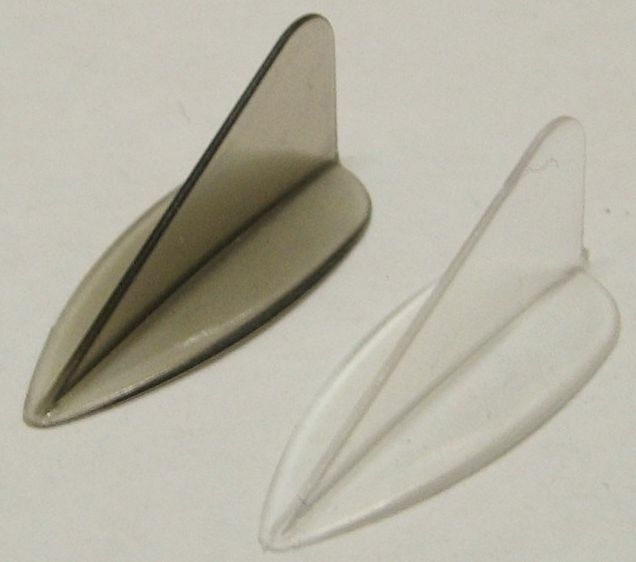 Stolspeed vortex generators have a very slim rounded fin to give them good flexibility, and a rounded, tapered base that ‘flows’ into the wing surface. They really do look like they’re meant to be a part of the wing rather than a ‘stick-on band-aid’. In clear material they’re almost invisible. There are many different grades of polycarbonate, from food grade to bullet proof. I selected the material that’s used here in Australia for skylites and roof panels. Australia has a powerful lot of sunshine all year round, and some of the highest UV levels anywhere. This polycarbonate material, Makrolon® manufactured by Bayer®, has proven itself on many roofs for many years through sun and hail, then I take it to another specialist processor who melts in even more UV stabilizer. It’s increased the cost of the material, but we do want the very best, eh!